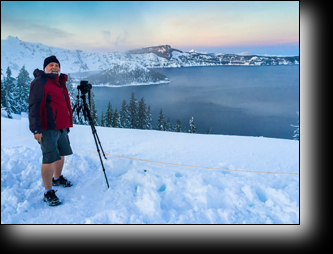 Crater Lake Panorama Sunset • A winter sunset at Crater Lake high in the Cascade Range of Oregon. I barely made it here in time for this photo. I started the day shooting the Oregon Coast at Brookings, I left there with a wild guess at how long it would take to get from the beach to the top of the Cascades for a sunset image of this magnificant lake. Still dressed in shorts I set off for the Mountains. Well my timing was off, before I got to the parking lot at the top of the mountain the skies were showing some evening color - I sped up. Upon my arrival I didn't have time to put on and sensible mountians gear, I grabbed my tripod, camera, hastily threw on a jacket and set off for the overlook without a moment to spare. It was twenty degrees with a twenty mile per hour breeze, it was also beautiiful enough to take my mind off my discomfort. I also became the center of a few photos as the other photographers at the overlook turned their camera on the idiot dressed for the beach.